The Hunter’s Dream serves as the base where hunters can purchase items, upgrade their character, repair and upgrade weapons, and more. It's here that you'll find the Doll, and Gehrman a mysterious wheelchair-bound advisor. 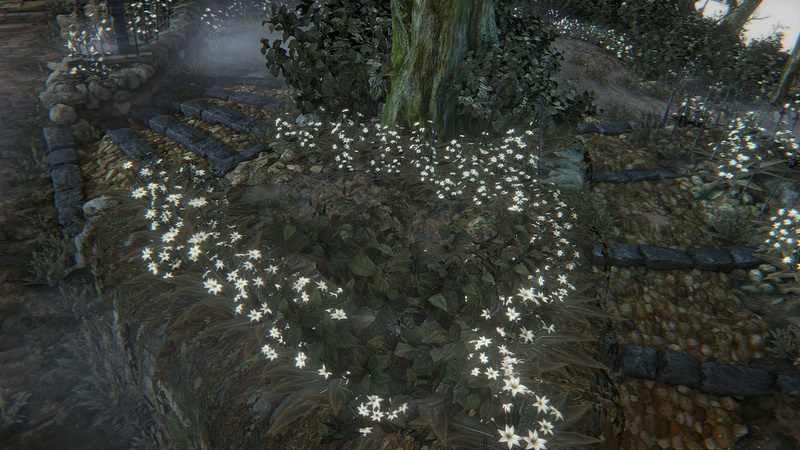 Use lanterns scattered around Yharnam to return to the Hunter’s Dream at any time. When you die the first time, you end up here. Use Blood Echoes to buy items from the Bath Messengers or sell unneeded items. As the story progresses, additional items become available for sale. After gaining 1 Insight, a Messenger appears that offers to trade items for it. As the story progresses, additional items become available for purchase. Use Blood Echoes alone to repair weapons or in combination with fortification items to fortify weapons. Sufficient Blood Echoes and fortification items are required to make repairs and fortify weapons. After acquiring Blood Gem Workshop Tool, Blood Gems can be fused to and removed from weapons. Up to three Blood Gems can be fused to weapons, each having its own effect, such as improved attack or an increased chance of causing status afflictions. Items in the player inventory can be placed in storage. Each item in the player inventory is limited by a maximum capacity. Acquired items that exceed the maximum capacity for that item are automatically sent to storage. The icon next to the item you pick up will be a box, indicating it's going to storage. When you die, the game automatically replenishes your Quicksilver Bullets and Blood Vials supplies from your storage. With the proper workshop tools, one can memorize Caryll Runes. Memorizing Caryll Runes yields various effects, including improved character stats and increased capacity for holding Blood Vials and Quicksilver Bullets. Offer items to a Holy Chalice and conduct a ritual to unseal a Chalice Dungeon. With a network connection, you can search for Chalice Dungeons unsealed by other players. As the story progresses, new type of Chalice Dungeons can be unsealed. Inspect the Makeshift Altar to automatically join an unsealed dungeon. In order to use Makeshift Altar player need to acquire Short Ritual Root Chalice item. Use the Stump Messengers to customize the appearance of messengers that appear in the field. After acquiring a messenger accessory, show it to the Stump Messengers, and thereafter all messengers will adorn that accessory. Hunter's Dream | Workshop: To escape this dreadful Hunter's Dream, halt the source of the spreading scourge of beasts, lest the night carry on forever. Hunter's Dream | Workshop Gehrman Spot: Ascend to Oedon Chapel. 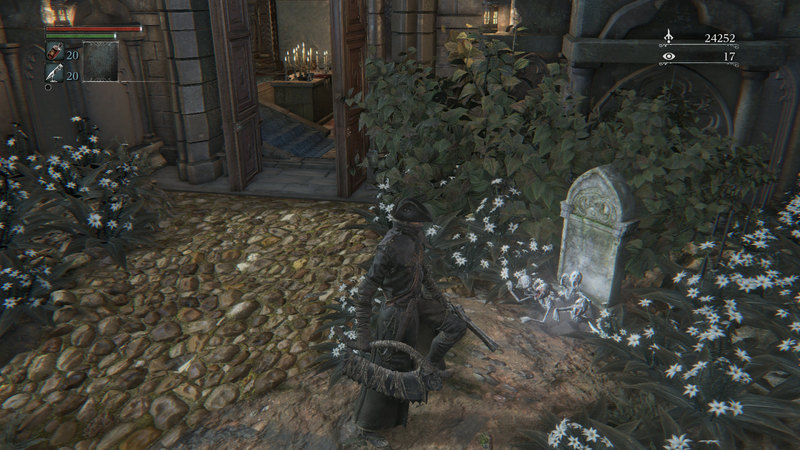 Hunter's Dream | Workshop Gehrman Spot: A Holy Chalice is said to be enshrined in Old Yharnam, seated in the valley. Before Yharnam Sunrise ending. After Yharnam Sunrise ending. Doll will occasionally pray there and have unique dialogue line. If you die for the first time or you use lamp to transport into the Hunter's Dream for the first time the "waking up" cutscene unfolds. However it is possible that you never died nor transported into the Hunter's Dream, which some call "Dreamless Run", and return in Late Blood Moon, after Mergo's Wet Nurse is slained, to finish the game. You will then experience the "waking up" cutscene as workshop is burning in the background. [video] Regular "waking up" cutscene and [video] Dreamless "waking up" cutscene. If you've started a new game, you'll need to make your way through Central Yharnam to the Cathedral Ward. Either purchase the Hunter Chief Emblem to open the gate, or advance through Old Yharnam and the Healing Church Workshop to reach the Grand Cathedral. Defeat Vicar Amelia in the Grand Cathedral and inspect the nearby skull to advance time to Night. Now, upon returning to the Hunter's Dream you'll find the Eye of a Blood-drunk Hunter at the foot of the Side Stairway. Take it, return to the Oedon Chapel in the Cathedral Ward and leave the building through the left exit to the Well area. Head over to where the Hunter's attire set was located and allow the Amygdala perched on the chapel to grab you. After a short cut-scene, you'll be transported to the Hunter's Nightmare. From this point onward, the gravestone near the rear entrance of the building in the Hunter's Dream will serve as your warp point to and from the expansion areas. A row of gravestones run along the stairway that leads to the Workshop's main entrance doors. Each of these stones is used for Chalice Rituals, with the exception of the lowest one, which is used for online matchmaking. Messengers spill forth from a fountain in the alcove opposite the gravestones; they act as a shop, selling you goods in exchange for Blood Echoes. More gravestones line the outer side of this stairway. These ones are used to awaken in various places in the real world. 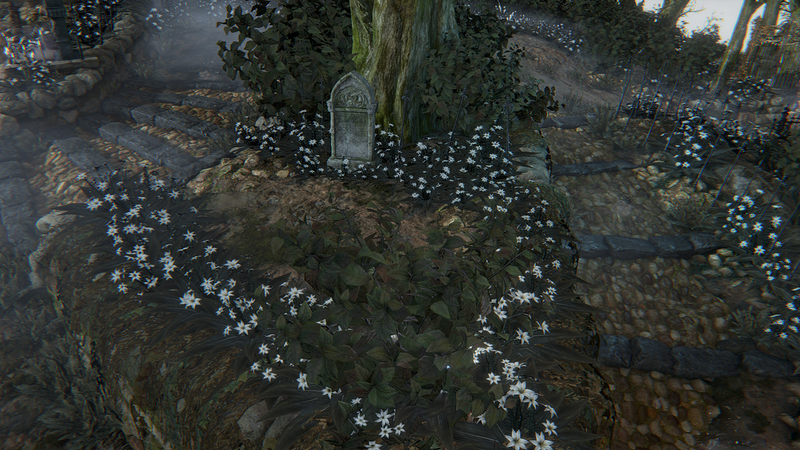 Initially you'll only be able to awake in Iosefka's Clinic, but the list of places will increase as you discover new areas and light more lamps The Lamps in the early areas will generally be on the first Yharnam Headstone, but as you explore more you'll open up options on the other ones higher up the stairs. The first time you visit the Hunter's Dream there are Messengers on the stairway, offering you a choice of starting weapons, so make sure you don't miss them At the bottom of this stair is a lifeless doll. If you return to the Hunter's Dream after acquiring some Insight the doll will awaken. 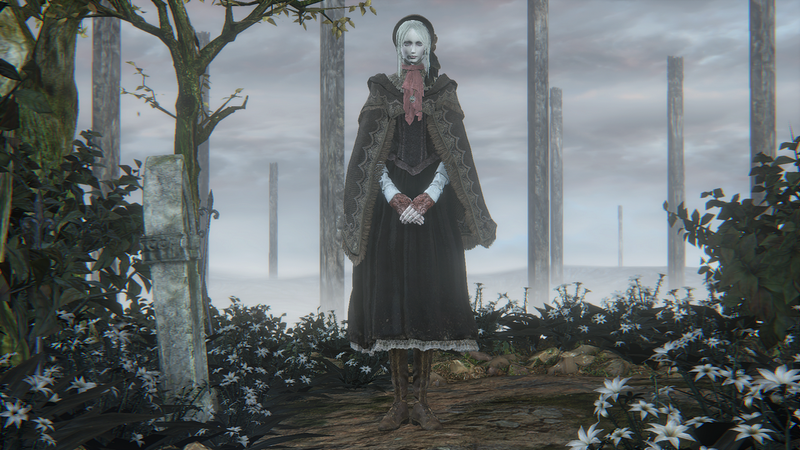 You can talk to her or choose to level up your character by spending some Blood Echoes. The Workshop's interior is dusty and covered in old books. Gehrman, an old hunter in a wheelchair, sometimes appears here with advice for you. To the right of the fireplace is your storage box, and to its left is the workbench, which you'll come back often to use for weapon upgrading and equipping Blood Gems There's also a small altar near the main entrance that will allow you to select and equip Caryll Runes once you've acquired a certain item. Opposite the fireplace there an open door, leading to a small ledge. Here you'll find another fountain, where Messengers are offering items to trade, but only when you have some Insight to spare. At the furthest corner of the garden is a locked gate, and until very late in the game the area beyond it will remain inaccessible. The Side garden is found to the left of the Workshop's main entrance doors. It is home nothing of interest, other than a small tree stump. Examining the stump reveals that Messengers may reside there, but you won't actually find them there until later visits. Once they appear you can use items you find in other areas to change the Messengers' appearance. Return to the Hunter's Dream after defeating Mergo's Wet Nurse and you'll find that things have taken a turn for the worse, as the end of the night rapidly approaches. Although the Workshop is now ablaze, you can still enter and make use of the facilities within, and all of the tombstones outside also remain fully functional. Carry out any last minute upgrades now, and attend to any unfinished business before heeding the doll's advice and making your way to The Great Tree. The gate that was once locked in the Lower Garden is now open. Head through it to reach Gehrman, who sits below The Great Tree. If you want to see the true ending to the game, make sure that you've used three One Third of Umbilical Cord items before speaking with Gehrman. No matter which outcome you choose, you'll automatically begin New Game+ upon completion, so make sure you do everything you want to do before continuing. After talking to Gehrman for a while he'll present you with a question, and your answer will determine how the nightmare ends. See Endings bellow. Gehrman is an extremely agile enemy that attacks aggressively while constantly moving around, making it very difficult to stay locked on to him. Be careful with your attacks because he can interrupt your attacks with his gunshots' be patient and wait for him to make the first move, and you can interrupt him instead. Once he's been defeated, you'll automatically receive the Old Hunter Badge and, if you have not used three One Third of Umbilical Cord items, the game will come to an end. If you did use them, however, there will be one final challenge to overcome.. Assuming you've met the requirements, the battle with the Moon Presence will begin as soon as you defeat Gehrman, so you'll have very little time to compose yourself. If you need a bit more time (or just want to resupply), you can exit the game and load your save file, and you'll reappear outside of the boss room with full access to the shops and other areas. This also happens if you die in the battle, so don't worry too much. Once you're fully stocked up, make your way back towards The Great Tree to begin fighting the Moon Presence. The head or limbs should be your primary targets during this intense battle; damaging them sufficiently will cause the creature to stumble or stagger, allowing you to get more hits in. You lived through the hunt, and saw another day. If you choose "Submit your life" during the converastion with Gehrman, the game will come to an end without any further battles. Captivated by the moon presence, you pledge to watch over the hunter's dream. Refuse Gehrman when he poses the question and you will have to face him in battle. You became an infant Great One, lifting humanity into its next childhood. Use three One Third of Umbilical Cord item before talking to Gehrman, and then select "Refuse" when prompted. You will then face Gehrman as usual, immediately followed by the Moon Presence.